Join Me! I am fortunate to be a contributor to the Alcohol Ink Art Society. This Society provides a wealth of information, tips, tricks, demonstration in the wonders of Alcohol Ink Art. This community teaches, encourages creativity and helps artists of all levels and is offering an Alcohol Ink Art Conference. Read below to find out more about the membership and the conference. We have a great line up of 12 artists. Watch and learn from these All Stars of Alcohol Ink as they share their experiences, tips, tools and best practices for creating your Alcohol Ink Art. Early Bird Registration through April 16th. If you are not a member of the Society, this is a great opportunity to join! Or, purchase a general conference registration at just $79.00 for 12 hours of instruction. What a great buy! 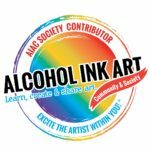 I am excited to be a contributor to this group of talented Alcohol Ink artists. Watch me during the conference as I demonstrate, in a full length tutorial, how to create my circles of passion abstract art on a gesso panel. I know that many of you are interested in different styles of painting with alcohol ink. This conference will help you grow in realism, abstract, seeing lights and shadows, alcohol inks and silk, blooms, waterscapes, painting a glass, painting animals, how to make texture, and adding entangles and doodles to your abstract art work. It will be a fun and exciting day! And you will have access to replay all the videos through the community Facebook page.